Bay Area Development Company provides low, fixed rate commercial real estate financing to small and mid-sized companies throughout Northern California. For more than a decade, e design has partnered with Brenda Komar of Chrysalis Marketing to serve as the company’s outsourced design and marketing firm. We have been responsible for multiple campaigns, both print and online. 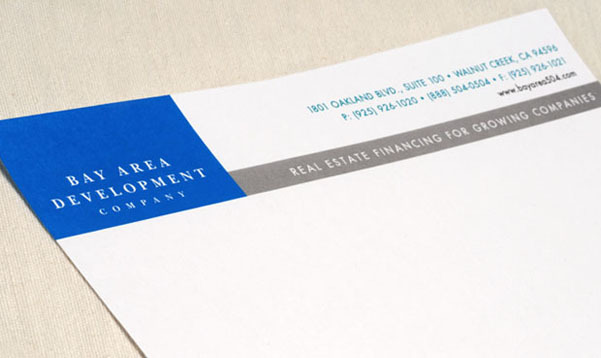 After marketing the company with the same logo for more than 10 years, Bay Area Development Company asked us to refresh their brand. We took a straightforward approach and updated their type and chose to keep the vivid corporate blue but also introduced greens and grays as secondary palette. The result is a fresh new look that is still familiar to Bay Area Development clients and colleagues.